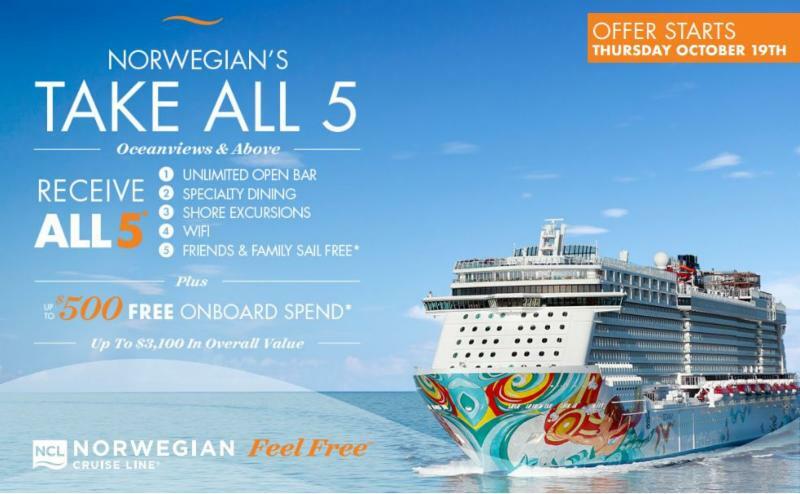 Featuring: Norwegian Cruise Line's "Take All 5" Promotion, Oct 19-20 only! Check out Norwegian's incredible Take All 5 sale — up to $3,100 in overall value. Book an Oceanview stateroom or above on select 2018 cruises and enjoy all 5 of Norwegian’s Free At Sea offers. What’s more, enjoy a $500 onboard credit plus reduced cruise deposits. Talk about having it all! But hurry, this is a two-day sale, October 19-20 ONLY , so don't delay! Contact us today to get started! Call 425-827-5656, or just reply to this email.